Whole grain. Good source of fibre. 7 vitamins & iron. Source of calcium. Suitable for vegetarians. 4.7 ***** rated by you? 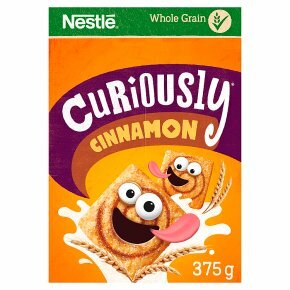 ?Rated on average 4.7 by 371 consumer reviews posted on www.nestle-cereals.com/uk/en as of October 2017. At Nestlé Breakfast Cereals we're working to help make breakfast better every day and your opinion really matters. We planned to show you a tantalisingly delicious shot of curiously cinnamon. Unfortunately it didn't go to plan... Burp!